Capitol • 2010 was worst year for police officers since 1987. 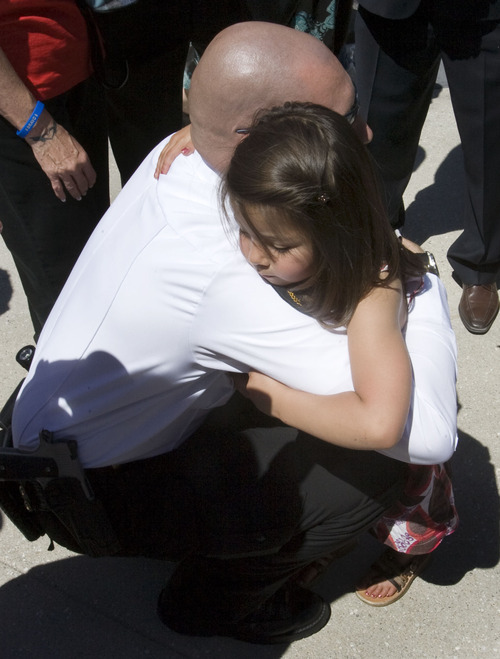 Steve Griffin | The Salt Lake Tribune Macee Yazzie hugs Roosevelt police officer Mark Cornaby following memorial service at the Law Enforcement Memorial on the Capitol grounds in Salt Lake City on Thursday, May 5, 2011. Macee's father, Bureau of Indian Affairs Officer Joshua Yazzie , 33, died in 2010 after his car went over a 200-foot embankment near Bottle Hollow Reservoir on the Ute Indian Reservation in Uintah County. Cornaby was a life-long friend of Yazzie and carries the key in memory of his friend. Steve Griffin | The Salt Lake Tribune Law enforcement officers from all over the state gathered with friends and family of the three Utah law enforcement officers killed in the line of duty in 2010 for a service at the Law Enforcement Memorial on the Capitol grounds in Salt Lake City on Thursday, May 5, 2011. Steve Griffin | The Salt Lake Tribune Macee Yazzie holds the hand cuff key that belonged to her father, Joshua, a Bureau of Indian Affairs Officer, and is now carried by Roosevelt police officer Mark Cornaby. They were part of a memorial on the Capitol grounds in Salt Lake City on Thursday, May 5, 2011. Officer Yazzie, 33, died in 2010 after his car went over a 200-foot embankment near Bottle Hollow Reservoir on the Ute Indian Reservation in Uintah County. Cornaby was a life-long friend of Yazzie and carries the key in memory of his friend. Steve Griffin | The Salt Lake Tribune Law enforcement officers from all over the state gathered with friends and family of the three Utah law enforcement officers killed in the line of duty in 2010 for a service at the Law Enforcement Memorial on the Capitol grounds in Salt Lake City on Thursday, May 5, 2011. Steve Griffin | The Salt Lake Tribune Law enforcement officers from all over the state gathered with friends and family of the three Utah law enforcement officers killed in the line of duty in 2010 for a service at the Law Enforcement Memorial on the Capitol grounds in Salt Lake City on Thursday, May 5, 2011. 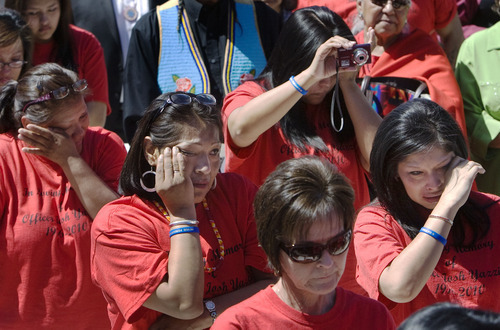 Steve Griffin | The Salt Lake Tribune Friends and family of Bureau of Indian Affairs Officer Joshua Yazzie wipe away tears during a memorial service for the three Utah law enforcement officers who were killed in the line of duty in 2010. 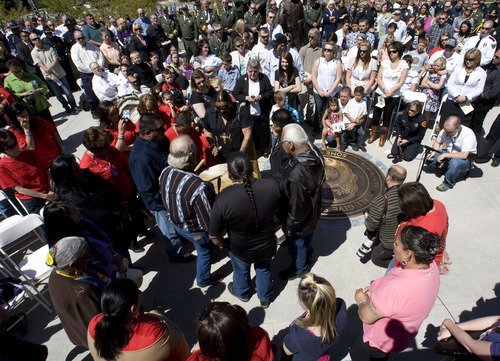 The memorial was held on the Capitol grounds in Salt Lake City on Thursday, May 5, 2011. Officer Yazazie died after his car went over a 200-foot embankment near Bottle Hollow Reservoir on the Ute Indian Reservation in Uintah County. Steve Griffin | The Salt Lake Tribune Law enforcement officers from all over the state gathered with friends and family of the three Utah law enforcement officers killed in the line of duty in 2010 for a service at the Law Enforcement Memorial on the Capitol grounds in Salt Lake City on Thursday, May 5, 2011. 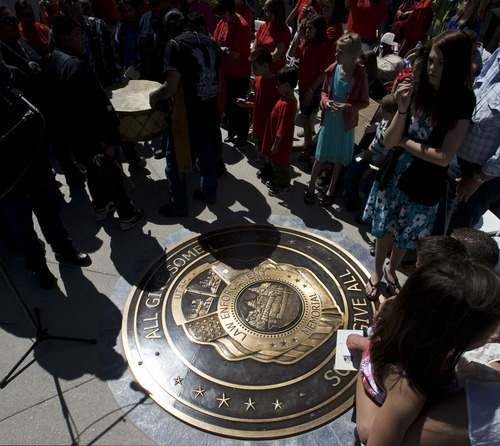 Steve Griffin | The Salt Lake Tribune Jessica Yazzie kisses her son Jaxsen during a memorial service at the Law Enforcement Memorial on the Capitol grounds in Salt Lake City on Thursday, May 5, 2011. Jessica's husband, Bureau of Indian Affairs Officer Joshua Yazzie, 33, died in 2010 after his car went over a 200-foot embankment near Bottle Hollow Reservoir on the Ute Indian Reservation in Uintah County. Family and friends of Bureau of Indian Affairs Officer Joshua Yazzie, who died while on duty last year, honored him and two other fallen officers Thursday with a ceremonial Ute song. A large crowd gathered at the Capital grounds, where Yazzie's name, and the names of Sevier County Sheriff's Sgt. 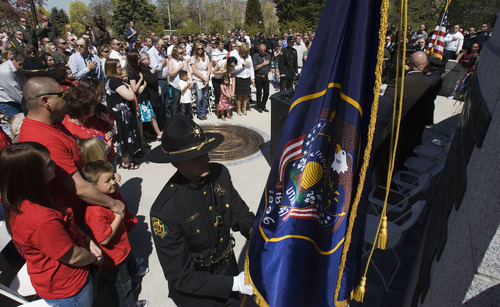 Franco Aguilar and Kane County Sheriff's Deputy Brian Harris ,were added to the Utah Law Enforcement Memorial. Yazzie, 33, died June 7 when his patrol vehicle rolled 200 feet down an embankment on the side of Bottle Hollow Dam on the Ute Tribe reservation in Duchesne County. "It's touching to know that all these people are here for my brother, my big brother," said a teary Camille Yazzie. "It's overwhelming." She remembered her older brother's habit of calling at 1 a.m. or 2 a.m. during his shift to simply ask: "What are you doing?" 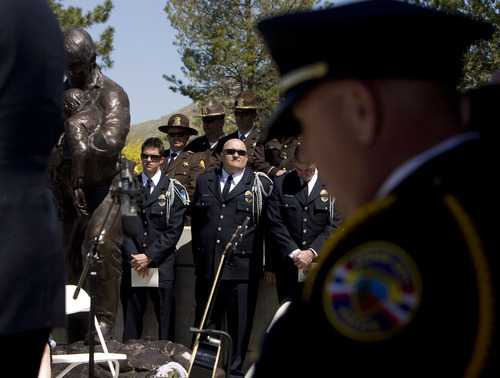 Along with Millard County Sheriff's Deputy Josie Fox, who was honored at the memorial last year, the four deaths made 2010 the worst year for police officers since 1987, when five died while on duty, said Robert Kirby, Tribune columnist and historian for the Utah Law Enforcement Memorial. Shawna Harris described her husband as not only a deputy, but a mechanic who often arrived places late because he was always stopping to help stranded motorists. "This was Brian's dream. He had always wanted to be a deputy," she said. "He served his job with honesty, dedication and determination." Harris , 41, was fatally shot on Aug. 26 while tracking a burglary suspect in the rugged desert east of Fredonia, Ariz.
Shawna Harris remembered hearing dispatch chatter about the suspect on her home police scanner, but tuned it out. A text message from a friend followed with the news that an officer had been killed. It wasn't until she saw police officers on her walkway that she knew the slain officer was her husband. Gov. Gary Herbert told the officers' families, "We appreciate the sacrifice that you give in letting your loved ones go out the door and serve us in a very difficult and challenging environment." Utah Attorney General Mark Shurtleff called the officers "three brothers with different backgrounds, cultures, and religions brought together and struck down in service to others." 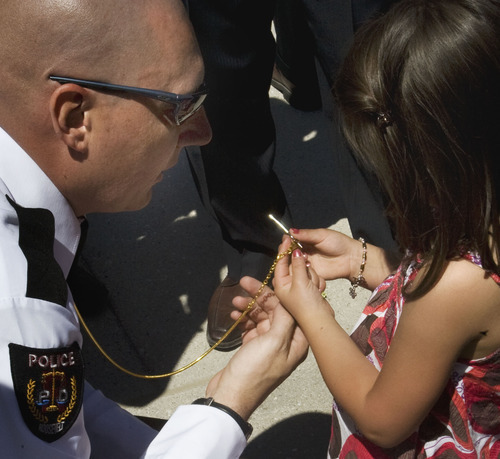 He said they serve as a reminder to celebrate our differences and "look out for each other." Aguilar, 36, died April 29, 2010 while assisting a motorist on an icy bridge on Interstate 70. He was knocked off the bridge and fell 250 feet to his death when another driver lost control of his vehicle. Rosalba Aguilar said her son's "favorite sport" was helping people. She said her son had dreamed of being in law enforcement since he was a boy. Following a tour in Desert Storm as a Marine, he enrolled in a police academy. Spouses and children of the three men placed bronze plaques, bearing each officer's name, onto the wall of the memorial. Posthumous Purple Heart awards also were given to the families.